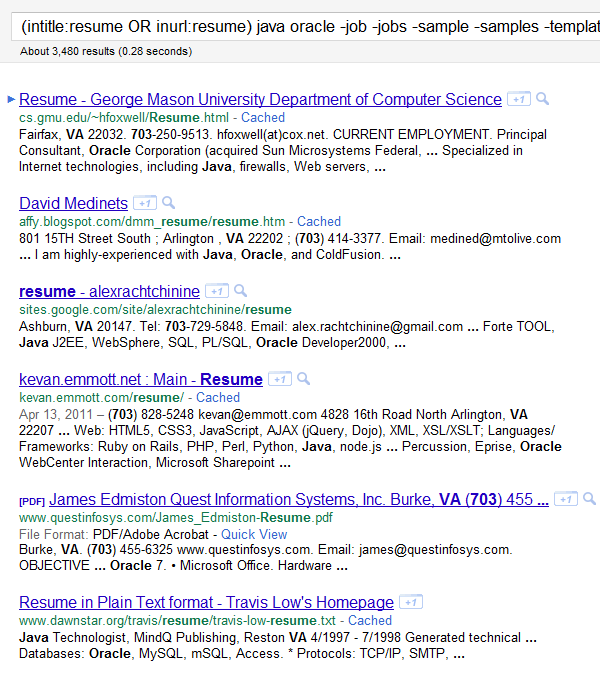 Want to learn how to find resumes on the Internet using Google? You’ve come to the right place! Whether you are new to searching the Internet for resumes or you are a veteran Interent sourcer, I’ve included some tips, tricks, and observations for the novice and expert alike. When using Google to search specifically for resumes, it’s a good idea to begin by searching for the word “resume” in the title and/or the url of web pages. Here is a sample result to illustrate how this works – we can see the word “Resume” in the blue TITLE line, as well as in the green URL line. The first line of any search result is the title of the webpage, and the url is the specific web page’s address. Targeting the word “resume” in the title and/or url is very handy, because for many people, it’s simply common sense/instinct to either title the web page containing their resume with the word “resume,” and/or save their resume using the word “resume” in the name of the file. In order to remove most non-resume false positive results, you can use Google’s version of the Boolean NOT operator, which is the minus sign, to prevent your search from returning results with words such as sample, job, etc. Some people who decide to make their resume available on the Internet also decide to publish a phone number. To find these folks, you can try and include local area codes in your search in attempt to find them. What you’ll notice, however, is that searching for area codes can easily produce false positive results, as can be seen in the screenshot below – which are the first 4 results from the search. Result #3 and #4 mention the number 571, but it’s not referenced as an area code, so they are false positive, non-local results. While there are still a good number of non-resume false positive results, this can be expected because we didn’t even search for any keywords/skills. Once we do, we will notice a significant drop off in false positives. Another way to search for local resumes is to target a zip code radius. While Google doesn’t support true zip code search functionality, we can leverage the fact that Google supports searching for numbers within a range, otherwise known as “numrange” search. You can perform a numrange search on any sequential (low to high) set of numbers by typing two periods between the numbers without any spaces. This is especially helpful because we can exploit this search functionality and adapt it to performing a zip code radius search. For example, take your target zip code and use this handy zip code radius lookup application, which you can use to search for zip codes in a radius and sort the zip codes within the radius from low to high. Using a central zip code of 75201 in Dallas, TX and targeting a 20 mile radius, we can use that zip code radius application to get a range of zip codes from a low zip code of 75001 to a high zip code of 76155. Don’t be tempted to try and write that as -(inurl:resume OR intitle:resume), because Google will not read that search string in the manner in which you intend. Instead of eliminating results with the word “resume” in either the URL or the title, Google will in fact will do the exact opposite. Click here to see the sad reality. Sorry Google. Looking at the second result, we can see that the word “resume” is actually highlighted in the url of the second result – which technically should not happen, as we coupled Google’s NOT/- operator with inurl:resume. 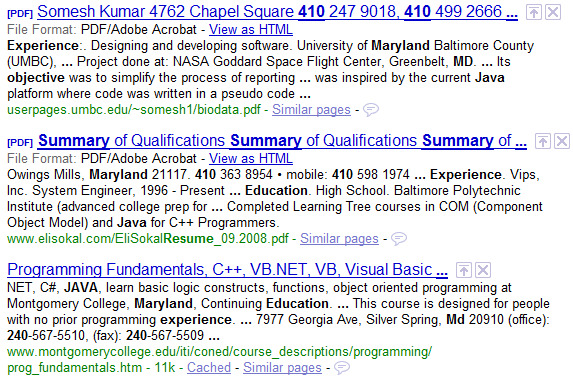 Yet more proof that Boolean search does not = Internet search. That’s 2 strikes, Google. The third result is definitely not a resume – it is a LinkedIn directory by name, within which is at least one positive hit on our search terms. While there are no doubt resumes on the Internet that do not mention the word “resume,” anywhere within them, I have found that when you stray from targeting the word “resume” in web page titles and URLs, you can quickly find yourself swimming in a sea of false positive results, which is a huge time drain. I believe the 80/20 Pareto principle solidly applies here: You will get 80% of your viable results from targeted resume searches and the other 20% from searching without targeting the word “resume.” Likewise, you can easily waste 80% of your time trying to sort through the sea of false positives in order to dig up the 20% of resumes that do not mention the term. 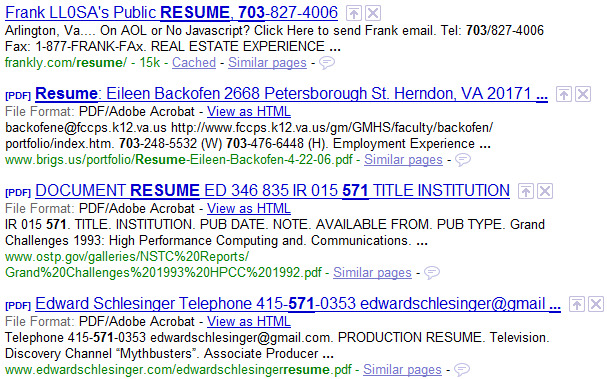 I’ve provided you with a quick overview of how to effectively utilize Google to search for resumes on the Internet. 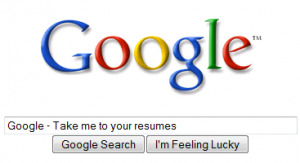 Be aware though – all is not perfect in when hunting for resumes in Google land – if you have not already, please read these 2 posts: The Internet has Free Resumes – So What?and Boolean search does not = Internet search. …you’re in luck. 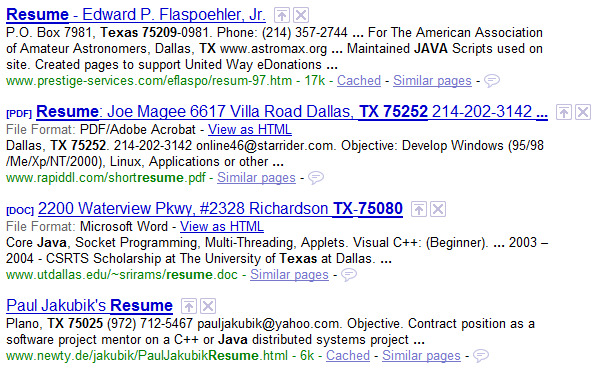 All you have to do is read this post in which I debunk common Google resume search suggestions and assumptions.